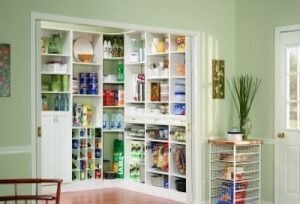 24 Sep5 Organizing Hacks To Get Your Pantry Holiday-Ready! Holiday season is approaching, meaning there’ll be plenty of cozy times cooking in the kitchen with friends and family. As we begin to prepare for the colder months that lie ahead, it’s the perfect time to weed out items that are expired and start fresh. 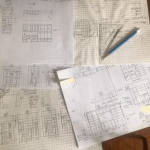 Designing a custom pantry with our experts at My Custom Closet is a great way to prep for the holidays! A well-organized pantry makes it easier for everyone to lend a helping hand in the kitchen. Plus, you can cut down on time making those delicious spreads simply by knowing where everything is. Tying it all together, it keeps clutter away so that you’ll love spending time in your kitchen too! It’s all about location! By sectioning the space in your pantry, you’ll never have to wonder where that cutting board went again. With everything in place, you can even design a gorgeous way to display items using accessories like mason jars and wicker baskets. This tactic works on even the smallest pantries! By utilizing vertical space, you’ll have room to store all your items and then some. Melamine shelving can be customized to your desired dimensions. Add some pull-out drawers and multi-sized shelves, and you’ve got yourself a spacious, organized pantry. Holiday cooking can get messy from time to time – especially when the little ones want to join in on the fun! To keep the space safe and clean, you’ll want durable and wipeable shelving. This takes a lot of the hassle out of cleaning up! Choosing shelving in different shapes and sizes for your pantry is the perfect organizing hack. Multi-sized shelves make it easier for your eye to visually separate between two different sections. For example, you can use shorter shelves to store your spices while chip bags are stored in taller ones. You can get even more out of your pantry by prettying it up. By choosing closet and shelving colors to match your kitchen cabinets, you’ll create an all-around cohesive look that’s pleasing to the eye. Ready to reap the benefits of an organized pantry? Click here to schedule your free in-home consultation with My Custom Closet. We were referred to My Custom Closet by a neighbor and couldn’t have been happier with the process and results. Bryan was extremely professional and courteous throughout the intitial consult, the design and feedback, and finally the installation process. Prices are significantly better than those from ‘name brand’ stores but the product is exactly the same. We loved everything about it and can’t recommend them enough.